When it comes to boosting your brain health, what you eat matters. The nutrients that go into your mouth can fuel your brain, helping you think more clearly and creatively, with enough energy and stamina. Since the brain is such a powerful organ, when it’s undernourished, it can be susceptible to fatigue—much like that “brain fog” you might experience when you haven’t eaten for a few hours. So, it’s a good idea to eat every three or four hours to boost your brain health and feel more empowered in the day. What should you be eating, exactly? Here are a few healthy foods that are rich in vitamins and minerals proven to improve your mental health. 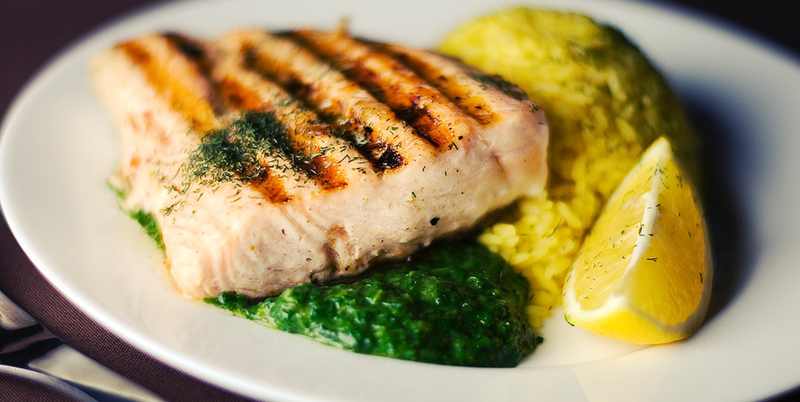 There’s nothing fishy about fish’s tremendous brain-boosting benefits. Studies have shown that taking fish oil or omega 3 fatty-acid supplements and eating at least 2-3 servings of fish a week can both prevent and improve symptoms of dementia. Plus, it can also aid in memory retention and reduction of inflammation in the brain. To get your fish fix, try grilling up salmon burgers this summer, topping a salad with canned albacore tuna, or even munching on sardines for a salty snack. While all nuts have great brain-boosting benefits, such as almonds and pistachios, walnuts are especially beneficial, as they contain omega-3 fatty acids to fight inflammation in the brain and lower risk of mental disease. And, if you don’t like fish or you’re vegan or vegetarian, walnuts are a great source of those omega-3’s you might be skimping on. Here’s more reason to wake up to a delicious, protein-packed omelet for breakfast. Eggs are rich in choline—though only in the yolk—which has been shown to improve brain health. Try one hard-boiled egg, which offers 230 mg of choline a pop. Just remember to keep that egg whole, instead of eating only the egg whites. Although high in protein, which is also great for the brain, egg whites don’t have choline. If you’re making an omelet, you can always use two egg whites and one egg, if you’re worried about cholesterol. Leafy greens, such as spinach, kale, and Swiss chard, are great for your mind, as they are packed with protein, iron, and B vitamins, all of which can contribute to a healthy brain. B vitamins in particular are essential for improving cognitive function. Try pairing leafy greens with legumes and whole grains for an even greater benefit, as grains and legumes are also fuel for your brain. Add spinach to brown rice for a side, or toss a kale or spinach salad with lentils, black beans, or edamame.